What better way to invest your money than snatching up your dream vacation home? If you think you're ready to purchase a second home, don't rush into it. Read this guide to ensure it's one of the best decisions you'll ever make in your life. Buying a second home is one of those treasured rites of passage, like getting married or buying a car. It's a sign that you're doing well and can afford to reward yourself. Now can be a good time to take the plunge, as mortgage rates are still at an impressive low. The first big one, for most people, is a question of finances. Most buyers of second homes are in their 40s and 50s, when their children may begin leaving the house. You're no longer tied to one place because of school, and since your kids are out of the house, you may be looking to establish traditions. Let's say you've always wanted to retire to the sunny beaches of California. When you're looking at another property, why not tailor your search with retirement in mind? That way, once you retire, you'll already have the property—and it'll have years to grow in value in the meantime. Finally, we can't talk about another house without talking about the tax benefits involved. Good news for you: the IRS allows you to write off the property taxes on your second residence. This applies whether it's an investment property, a rental property, or solely for your own use. Tax advantages don't end with property taxes, though. You can also deduct interest, insurance and depreciation against the home's value. For more, take a look at this tax guide for rental property owners. Before you buy, you should be aware of a few key differences between your primary and secondary home. For one thing, it's a matter of priorities. When you chose your first home, you chose somewhere you could live day to day, so it had to meet a few key criteria, like the quality of the school system. When you purchase your next residence, you're going to be more concerned with whether it has everything you need to enjoy yourself while on vacation. 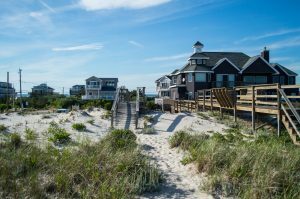 There are a few key differences between a primary and secondary residence that aren't just about the beach. Your mortgage and interest rates will change based on which home is your primary residence and which is your secondary. In order for a home to be considered your primary, it must meet the following criteria: You must live there the majority of the year; it must be conveniently located near your job; and you need documentation to prove residence, like voter registration. A secondary home has to meet the following criteria: It must be exclusively under your control; you must live there for some part of the year; it must be accessible by car year-round; and it must be a reasonable distance from your primary residence. When we say "exclusively under your control," that means that the home cannot be subject to a rental agreement, timeshare or similar arrangement. You can rent the property out to others, but if you're renting it yourself, it doesn't qualify as a second residence. Then, there's the difference between a second home and an investment property. To put it simply, an investment property is a property purchased with the intent of earning a return on rental income, future resale or both. While you can rent a second house, it's legally different from an investment property, which means it's subject to different loans and mortgages. Specifically, an investment property is purchased for the exclusive purpose of renting to tenants, not for your use as a vacation home. A home qualifies as an investment property if you can prove the property is occupied by a tenant. This is usually done with a lease agreement; however, if the tenant has the ability to purchase the property from you, this must be secondary to the mortgage. And if your tenants are paying month-to-month rent, you'll also need to provide a letter to that effect. Now that you know your way around the basics, let's talk about a few dos and don'ts of buying a second home. Remember, you're not buying a house with the intention of moving there full-time; because of this, your priorities will be different. The first question to ask yourself is what your goal is with the second property. Do you want to be able to go there for summer vacation every year? Do you want to rent it out full-time and retire there in 20 years? This will change where you purchase a house. You also need to consider what your long-term needs will be. If your children will grow out of your current favorite vacation spot (or if your current favorite spot isn't super accessible), that may throw a wrench in your long-term planning. As with your primary residence, it's important to know the area. The difference is what you're evaluating the area for. Let's say you've picked out a San Diego neighborhood. Thing is, you're not checking out the school system or the aspects related to permanent residence. And if you're choosing a place in your favorite vacation spot, chances are you haven't noticed some of the less obvious things that only show up when you live there—things like local politics, crime rates and property taxes. The best way to get familiar with the area? Start chatting with people who live there. And not just about crime and politics either—ask about what there is to do year-round. If you plan to retire here but only like one event a year, you're going to be bored. Let's be honest: Even if you've vacationed in an area, you just don't know it like a local. If you're looking to buy a home in the area as a non-local, you need a local real estate agent to point you in the right direction. There's also the fact that real estate is a highly-localized business. To get the best deal on a property, you need a real estate agent who knows the neighborhood like the back of their hand. Sure, there's appeal in a single-family house, but if you're not living there full-time, do you really need it? Think about it: If you purchase a second property, you need to maintain it. If it's a house, that means a lawn, heating and air conditioning, pipes and other tasks. Also, if you're not living there for nine months of the year, that means you're either trekking out to the property once a week just to clean it, or you're paying someone else to clean it for you. A condo, on the other hand, requires far less maintenance, and it's easy enough to delegate tasks to someone as needed. If you plan on retiring to your second residence, you'll also need to consider how your own needs and abilities may change as time wears on. You may not be able to maintain a house on your own, or may need a house with better accessibility. Above all else, do not impulse buy. There's any number of reasons for this: finances, for example, or not taking a long enough look at the area. The next thing you know, you're stuck paying a second mortgage on a house that isn't really the right fit for you. When you buy, you should be in the right mindset to take a long, hard look at your finances and how much house you can afford. A second-home affordability calculator is a great tool to use in this situation. Similarly, you need to seriously consider what you and your family need from a second residence. Before you sign on the dotted line, pack up for San Diego, and break out your favorite moving tips, there are a few more things to keep in mind. Since this is your second residence, your mortgage situation will look a little different. There are also additional considerations since you won't be spending 365 days a year in the new house. The big thing to think about is what will happen to the house while you're not there. Will you rent it? Even if you don't, you have to think about upkeep when you're not there to dust and wash the windows in person. Unless you have enough cash on hand to pay for your second home out of pocket, you're going to have to get a second mortgage. Here's the thing: depending on who you ask, your house payments (including your mortgage, taxes, etc.) shouldn't cost more than 35-45 percent of your pre-tax income. If you're looking at a conservative estimate, it shouldn't be more than 25 percent of your take-home income. Regardless of how conservative you want to be with your money, the ratio is consistent regardless of how many properties you own. There's also the fact that second mortgages are generally viewed as a higher risk. The best approach is to talk to several lenders about your options and keep in mind that there may be a significant disparity between how much you're comfortable paying each month and how big of a loan you can qualify for. If you're like most second-homebuyers, you're looking to earn a rental income through your second property. If this is the case, you need to figure out your rental strategy early on. The easiest way to do this is to figure out what you'd like to earn in rental income from the property each month, and then take a look at rental prices in the area to see what you can reasonably charge for your property. At a minimum, your rental income should equal the amount you have to spend on the mortgage and other expenses. If you can't meet that cost, then consider purchasing a cheaper house. As the old adage goes, only two things are certain: death and taxes. Fortunately, there are a few tax breaks on second residences to make your life a little easier, such as the ability to write off property taxes on your second home. There are a number of deductions and tax credits you may receive on your first home that won't apply to your second. Rules about property tax deductions on second homes also vary based on what state you live in and how often you use the second residence for personal purposes. If you're planning on infrequent renting, good news: If you rent out a property for less than two weeks of the year, the income is tax-free. If you rent it out longer, you'll need to declare the income and pay taxes on it. The best approach here is to talk to a tax professional. They can walk you through the details of the tax code and let you know how your second residence will affect your tax situation. Finally, you can't purchase a second home without considering the extra expenses associated with it. What other extra expenses? Think about all the extra money you spend on your house throughout the year: redecorating, renovation, but also basic maintenance and upkeep. There's also homeowner's association dues if it's somewhere with an association, and possibly a second insurance policy. When you take a good look at your finances, be realistic about how much you can afford to pay for these additional expenses. Otherwise, you may still be losing money on your second home. Co-founder of Aumann Bender & Associates, Joy Bender is a San Diego luxury real estate digital marketer specializing in selling extraordinary real estate. Real estate agents interested in growing their business with digital marketing, or breaking into luxury real estate can join the conversation in Facebook Group Luxury Real Estate Sales - Digital Marketing.